The Snapchat-inspired carousel content format, commonly known as “Stories“, is absurdly engaging. That’s why Instagram and parent Facebook copied it without ingenuity and made it famous. WhatsApp shortly followed, but another tech giant to be finally bitten by the bug is Google which is now testing the Stories format in Google search. As The Verge reports, Google has only begun testing the format yesterday and if you search for news portals like CNN, People, or The Washington Post, you should be able to view relevant articles in the form of Stories. But there’s a degree of luck you might need because the number of Stories available currently will be extremely limited. Google is clearly awestruck by the “visually rich” appeal of storytelling through these carousel or slideshow filmstrips. These Stories or “AMP Stories”, as the name suggests, rely on AMP web pages that are designed especially for publishers to help users load content faster and with a cleaner interface. Used to route mobile traffic from Google and Bing search as well as Twitter, AMP is gaining more importance as traffic from smartphones and PCs stands neck to neck quantitatively. But Google claims these slideshows will be visible across all devices and not limited to mobile search. As these Stories are dedicated to news, they appear pretty much like the Discover feed in Snapchat with basic controls like tapping on the right or left to skip the current page. The interface is likely to be supporting fewer swipe gestures compared to the native Snapchat or Instagram apps because of the high-speed requirements of AMP. While AMP articles are primarily intended to quicken the speed of loading, content pretty much remains the same. Moreover, the sea of news articles jumbled with marketing material on Google Search has, sort of, become overwhelming, which is why many people turn to social media for their daily news instead of depending on Google. 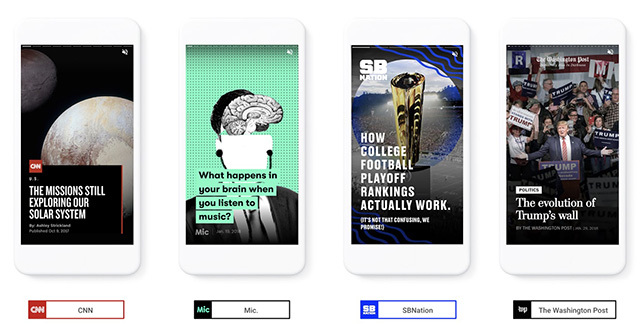 But, AMP Stories will trim information into concise and interactive – besides visually appealing – slideshows which, I suppose, should make learning on Google easier and more engaging than before.